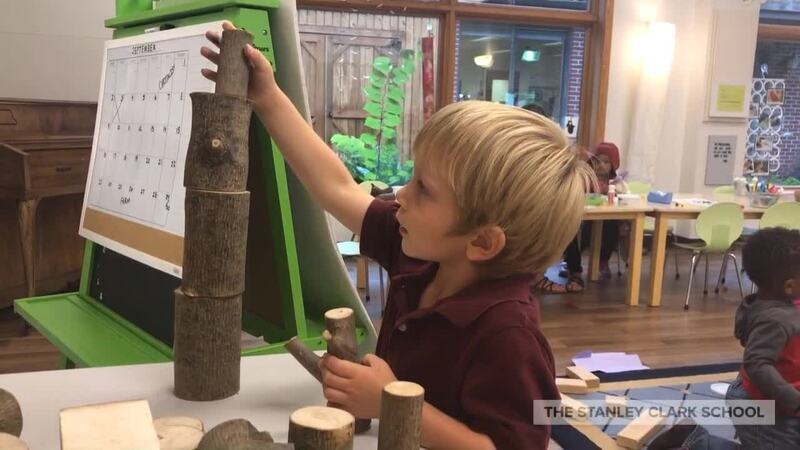 Stanley Clark’s early childhood program incorporates the innovative and unique program of the Reggio Emilia Philosophy, which incorporates all the ideals that we believe are essential for the development and education of young children. From the careful design and organization of space to the documentation of children's work, conversation and activities, ours is truly a child-centered education. Early childhood teachers work with the children to create an atmosphere that promotes open-ended, process-oriented discovery and exploration. Although they are young, early childhood students are competent and capable of incredibly wonderful creative work when they are presented with sophisticated tools. Careful consideration is given to the design and organization of space, equipment and materials because the physical environment is considered another teacher that has the power to facilitate learning. Throughout the environment, indoors and out, children are consistently given the opportunity to communicate what they know, wonder, feel and imagine through a fantastic variety of materials and activities. Our respect for our young students and the value we place on their work is evident in the process of documentation. Transcriptions of children's conversations, photographs of their activities, and representations of their work produce displays of the children's thinking and learning. These displays become points of reference for the children, parents and teachers. Our faculty are life-long learners who accompany the children on this journey. They continue to study the Reggio approach and to interpret and apply the Reggio philosophy within our culture and context. In 2004, The Garatoni Center for Reggio Studies was built as an addition to the existing preschool, Fannin Hall. Our architects immersed themselves in the Reggio Philosophy, allowing them to design rooms which heighten the Reggio experience. For example, large, aligning windows create a feeling of connection to the outdoors. Since parents are encouraged to be involved in what happens at school, windows, corridors, and observation points allow for parents and other visitors to observe the classrooms unobtrusively. Our Garatoni Center for Reggio Studies is designed both architecturally and educationally to enable training of other local and regional institutions seeking to study the approach. Relationships have already been established with several local universities including Indiana University South Bend, Saint Mary's College, and Ivy Tech in order to become an integral part in the professional growth of early childhood teachers. There are tremendous academic skills in addition to social and emotional lessons to be discovered through play. In kindergarten, play is of utmost importance. The first day of preschool can evoke a wide array of emotion for both the parent and the new preschooler. But being prepared can help! Consider these six strategies for making the transition as smooth as possible. At Stanley Clark, we value the tremendous benefits of recess to our students’ development. Learn more about these four key benefits: cognitive, social, emotional and physical. What does it mean to be a Reggio Emilia inspired preschool? Discover what a Reggio classroom looks like in action, through a month-long creative project initiated and inspired by preschool students. Challenging. Inspiring. Engaging. These are a few words used to describe the unique Stanley Clark curriculum. The academic experience of students is complemented with education in the arts, athletics and character - an empowering combination that results in graduates who lead, volunteer, inspire and excel. Course descriptions may be found below. Please note that our responsive, adaptive pedagogy and desire to meet students' educational needs may necessitate additions, modifications or deletions to the curriculum midyear.